There are some days when the weight of the world feels a little more than my shoulders can carry upon it. There doesn’t have to be any one thing in particular that makes it feel that way; it just does. Those days make grace a bit of a struggle for me to reach towards. More for myself, than others, though the outcome can be the same for both, unfortunately. And those days, are just plain hard. I don’t often write about the hard days where depression has surfaced through the years, and to be honest, I don’t want to write about it now. I don’t want to look like there is a chink in my armor; but if I really let you see me, you know… REALLY let you in…the nicks and the scars of the tumble are visible. I feel the breeze they allow to touch me, and it makes me shiver. I want to be transparent here, in a way that allows you freedom to heal if the lessons I am learning can be a vitamin of grace. It is risky to share deep things; hard lessons always are. But I am learning that pride is more of a ballast than a life preserver and I want to cling to grace more. The cycles of grace follow His sufficiency in our trials and tears. I don’t fully understand the cyclical nature of this battle I’ve struggled against at times in life . For years , the emotions were just a ‘part of my make up’, even when it felt unnatural. Of course normal life stress was to blame, but the fact that every year at a certain time I found myself stuck, revealed the pattern. Usually the start of the school year was the catalyst for the burdens to build. They kept me weighed down deep and for a long time I wasn’t sure how to break that cycle. Because I’ve been told, that the things we have struggled through…the trials we have rallied against and seen the light on the other side, are the mission fields of grace on our journey. It is true that the struggles we have known make it easy to identify the same struggle in others. And that we want to help others move quickly past those pains, is truly grace in action. I wish we could sit face to face with coffee or tea and link hands in prayer so that I could tell you the stories, rather than the sterile words on a screen. I don’t want to just hit publish and let that be it, because it is vulnerable and it is raw …. and well, that is a little intimidating. Even though I can’t meet you across the table today, still the Lord compels me to write some words that I hope will bring you grace in the struggle you are facing. Because this journey, it is taken one step at a time. And since we are turning on this terra firma ball in the cosmos of the heavens, we may just revisit a few things as we go together. And that is ok. When we share the grace words, we link hearts and hands in spirit, and freedom comes when we pursue grace together. Did you catch that? It is ok if we have to go back and deal with junk once in a while, because it doesn’t mean we weren’t freed from the grip of it before. It just means we are stronger and we are ready to go deeper. We can go deeper to where the healing needs to reach. We can go beyond the surface. But sometimes, when we are struggling with grace, He chooses to pour it on us continually so that we drown in the ocean of His love and learn to wade. The wading process seems easy at first. It is just a few arms and legs flailing around in the water, but wading is hard work and before long my arms get tired. Soon I am on my back floating all over the place because I can’t move any more and I stop struggling against the pulling current against me. Floating takes faith friends, trust that we will stay afloat and not sink. If grace becomes a struggle, we need to float on the ocean He floods over us. When my days become the weeks where wrestling looks a lot like the unnecessary wading, I get really tired. And somehow it always a surprises me when I lose a grip on this grace journey. I don’t know why I am surprised… but I think it has to do with this desire to be so fully done with that weak link in my armor that I want to pretend it is not there. I forget the healing takes time and the Lord’s patience is so much better than mine. He knows. and if I am listening, He is also speaking to my heart in the bold strong whisper that has been sounding in my ears from the moment the need was apparent. I just don’t always listen. Sometimes, it takes the soldiers of grace to lift up our hands when we are weary. Days that were hard would find me soaking the atmosphere of praise music while I was petitioning heaven as God’s Word went in and out of my mouth, and lots of long quiet powerful runs. All good…friends. All of that is good. But, sometimes He calls us to bring in the troops. To rally the forces of faith around us and lift us up like Aaron and Hur lifted the weary hands of Moses on the hilltop while Joshua and his army defeated Amalek. That hill, where faith stood tall, now bears an altar with a name called Banner that waves His victory over it. That, friends is where I want invite you to join me in this. I have been here before, on this hill with hands lifted up; resting in this battle between Israel and Esau at Rephidim. An age old tale of repeated struggle, friends. I have gone around the same mountain so many times that I could see the ruts in the road of my walking. If you read through Exodus 17 you can see the prophecy it holds, a war to last for generations. -The Hebrew word for ‘steady’ in Exodus 17 is emunah, which means faith. This pattern of repeating and revisiting the same thing is cyclical. And I could see that one of the most important tools in my faith journey was to have friends of faith speaking life and lifting up my hands as we stood on the hills of our battles. Freedom comes with our admission that we need prayer. In my need to be, ‘ok’, I missed a vital part of the victory over the cycle of war that has seen generations. I left out the freedom that comes from saying, I need prayer today. I was so stuck in the pattern of shock that I was here…again, and I failed to truly see the lifeline that was always floating right next to me. I was struggling to stay afloat when all I had to do was stand up and rally the forces and ask for prayer. And you know what? It was immediate. The response to my request was met with grace…not questions or condemnation. 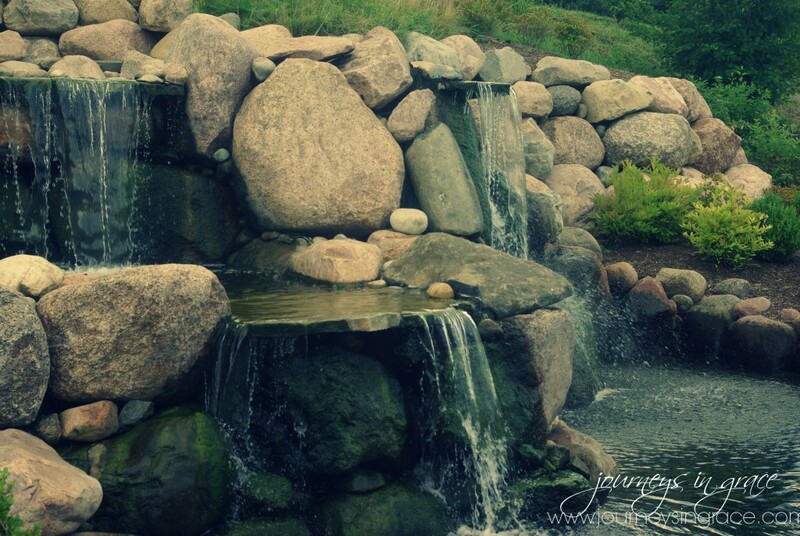 In fact, the peace that washed over my heart in just the asking was soul cleansing. That alone, is a gem of truth that we all miss, too. Doesn’t the Bible say if we ask we will receive? But friends, the tearing down of the wall of pride that surrounded my nearsighted heart had to come on my own time. When I could see in scripture the truths that were there, waiting to be found, it was like a glaring flood light upon the raging tempest inside me. When you can finally see where you are in the midst of the struggle, grace allows you to float. And the best part were the quick notes I got days later, just checking in. You see, the heaviness left the moment I asked for prayer. The minute I let down my guard, kicked pride to the curb, and made the choice to let God be my Banner. In that instant the weight was gone and made room for the peace that passes all understanding. It made room for healing to complete the work patience sets forth. 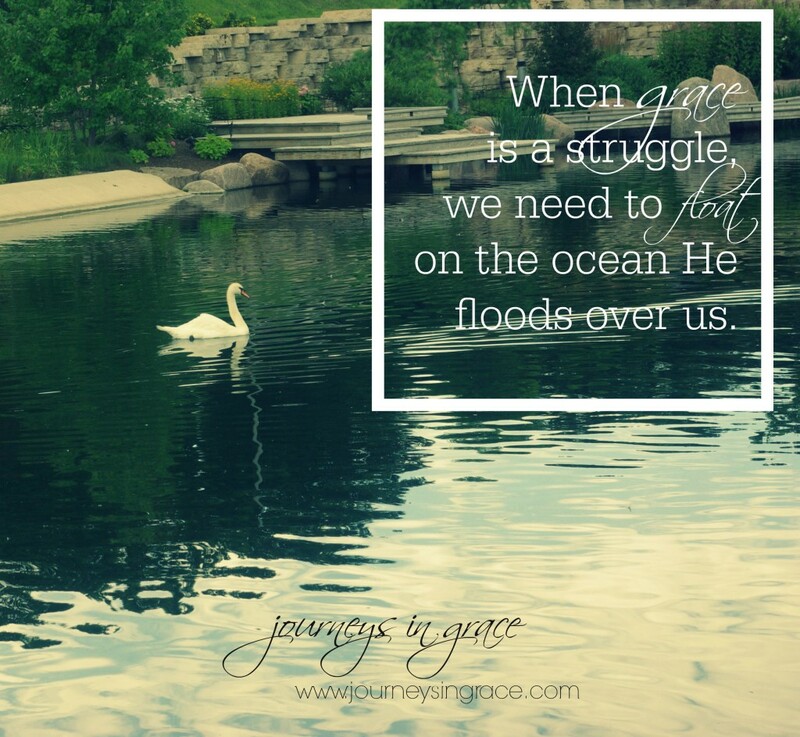 When grace is a struggle friends, stop wading in the ocean of heaviness and lean back. Let your self rest in His goodness… floating on waves grace brings to support you, because when the motion stops, the waters calm and you can see that it isn’t nearly as deep as you thought. The disappointment kept me from judging the situation rightly, to see He had brought me closer and closer to the shore each time I learned to rest fully upon Him. The life preserver is always there, waiting to be used, we just need to reach for it. It has been a long time since I really felt the heaviness of that weight, and I know that there are certain triggers that set it off. I am not always sure what it is, but I do know that God has always brought me to the shallow waters to float on grace. Each time I find myself there, I gain a firmer footing on my stance and I can breathe a little deeper. Even though it seemed there was a retreat from the line of victory, in truth, I was inching that much closer to the healing that He has already provided. As we build altars to the Lord, proclaiming victory over the battle fields we find ourselves in, we can wave banners of grace over them with gratitude for the faithful prayer warriors He sends our way. I am just beginning to study the ramifications of this little nugget here about Amalek and Israel and how it matters to us. I can see the shoreline as I look through the lens of His Word and find grace in these moments of weakness because I can see the reason for the return, again, to the altar where I ask friends to grab hands tight, pick up the banner, and wave it strong… watching for the enemies retreat. How can I lift up your weary hands today? When the struggle with grace is an ocean you are tired of wading in, I am praying you can float in his arms and stand strong with those who are lifting your hands above the battle. Thank you for stopping by my online home today! I love the heartfelt thoughts in this post and sharing something we all struggle with from time to time. Those God sends our way to pray with us are such a gift on this journey! I especially love your words about standing strong in our daily struggles and battles. My questions and uncertainty overwhelm me sometimes and I’m so grateful you shared your similar sentiments — nice to meet you, friend! Amen! This applies – even to those of us who don’t travel in oceans of depression or despair – but rather walk in the Valley of the Shadow of issues and problems, challenges, and overwhelming confusion. Your words are like an ointment – gently applied and soothing, beginning a healing. I hadn’t considered grace in the equation. But it is, isn’t it? We must receive that grace, stop struggling against it. Wonderful images! Also, I didn’t remember the story of Moses…perfect. I have truly been blessed as your neighbor at ThreeWord Wednesday today. Dawn, it takes great courage to share so transparently, but you have done so beautifully and with great grace. You are so right – inviting others in links us together in grace. And it gives others the freedom to share their heart too. I’m cheering you on, sister in Christ. You are more than a conqueror in Him and I pray grace upon grace over you today. Stopping by from #threewordwednesday. so glad we are neighbors at Laura Bogess’s this week! such encouragement! Thank you for your honesty in sharing about your depression, Dawn. I think it’s so beneficial to hear for both those who also have suffered (or continue to suffer) with it, as well as to those who have NOT, so that they can understand a little bit better. If we haven’t experienced it ourselves, we all know someone close to us who has. It is also what we learn, the comfort that we receive from God in those hard times we are to share with others. Dawn, love your vulnerability and honesty in this post. Much love to you, sweet friend. This encouraged me so much today, and I will be sharing it with my online prayer group later this week. Dawn, thank you for your transparency. If we can’t be real with one another, if we’re afraid, then why write? I love this: “The disappointment kept me from judging the situation rightly, to see He had brought me closer and closer to the shore each time I learned to rest fully upon Him.” Resting on him and not trying to figure it all out is what brings us closer to His grace, and grace is what we need to overcome. Thanks for sharing. Your neighbor at Missional Women. I really love this. His grace is so freely given, so comforting… and yet I fight against it. I’ve been learning to cling to it, to battle for it, and to accept it freely. I’ve written about grace quite a bit too. I think our stories are compatible. Dawn, You blessed me with so much truth here. Thank you for allowing yourself to be vulnerable. His grace washes over and holds up. Oh, how I need to lean in and let His amazing grace sustain me. Blessings and hugs!! 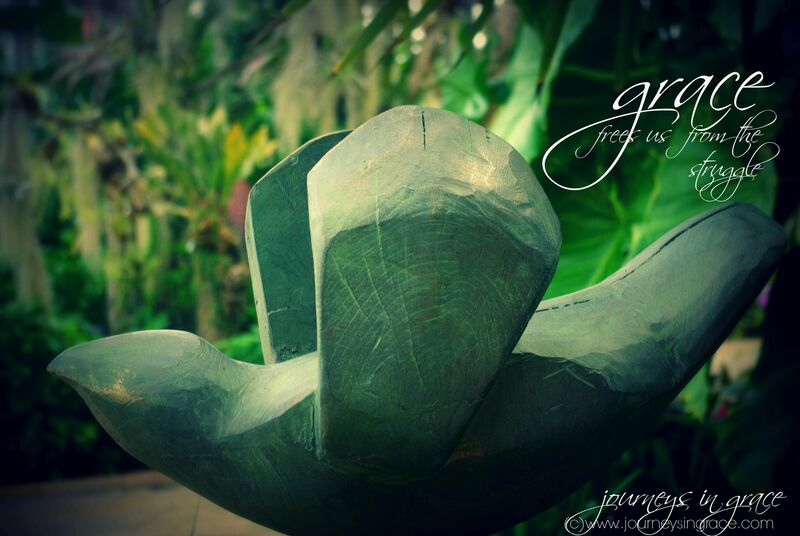 “Floating on waves of grace.” This was just beautiful and so uplifting. We all need this reminder! Beautiful post and strong testimony. These apply to so many situations beyond depression. really to whatever we’re struggling with in life. This is beautiful Dawn. I don’t know how else to be in my writing but real and transparent. My weakness before the broken gives another courage to face her own story. I am thankful for His grace. Oh it’s hard to wear it sometimes, this grace, but I am so glad that when we are willing to lift our voices before the Lord, to share the messy, He is glorified and others have hope for healing. Can I just start with “vitamin of grace” … That is an amazing analogy. I read it over and over and let it sink in. Yes, I’ve been deficient and it’s never a good thing. I would never have guessed you battled this battle, but I’m so privileged to read the words that you share. You are SO right that our trials become our mission fields. You have offered affirmation of that over and over to me and I want to send it back to you. Now I get it. Those who have struggled are the most quick to encourage others in the struggle. So much of who you are to all of us begins to make sense. And soldiers of grace? That’s you, dear friend. I have returned over and over to the story of Aaron and Hur and Moses. To find you over here showcasing it, is some sort of bond and kindred spirit-creating-moment. Wow, just wow. Because spiritual warfare is what God revealed to me last night was my real issue. I have been struggling against so much since I began to write “enemy expose´s” and never thought I might actually be under attack myself again. Thank you for opening my eyes with your insight into the Amalekites. Again, wow. You have lifted up my weary hands today with your words. And you do so each time you visit and leave such a trail of grace on my blog. Thank you for being here, where I know I can come and drink deeply, even if I forget to do it often. I’m going to find a place to sign up and follow you as soon as I post this comment. Dawn, what beautiful truths you share here, and so gently, too. 🙂 I get what you mean about the cyclical nature. And it’s so easy to get upset with myself for “not learning the lesson the first time,” so I love the idea of Jesus just waiting on us to catch up, to catch our breath, to rest before the next push foward. Thanks for sharing these words with us at Grace and Truth last week!